Miniature Lilac. They are known for their fragrance and it certainly is lucious. Like all bushes, they do require some pruning. Yesterday was such a beautiful day, I decided it was time to tackle my bush. I do not just prune, I sculpt too. :) Yes, it has to look even and just as beautiful. Dip, spray or wipe the blades of the pruning shears or loppers using rubbing alcohol or a solution of 10 percent bleach and 90 percent water. Clean them this way between uses and between plants. If you are pruning the lilac to remove diseased sections, clean after each cut to prevent the spread of disease. Cut spent flower heads off after the lilac has finished blooming, when one or two new shoots become visible under the flower cluster. Make the cut just above a new shoot or bud. Cut branches back selectively to shape the dwarf lilac bush as desired, removing no more than one-third of any stem and making a clean cut just above a bud facing in the desired direction. Dwarf lilacs generally require little of this type of pruning. You may only need to cut one or two overly vigorous, out-of-place branches back. Cut one or two of the lilac's oldest stems back to the base of the plant if the shrub is several years old and becoming bare or scraggly looking at the base. This encourages the growth of new, vigorous stems. Monitor the dwarf lilac throughout the growing season for damaged, diseased or rubbing branches. Prune off the problematic portions to just above a branch or bud growing in the desired direction. Dispose of any diseased portions you remove away from desirable vegetation. Remove all but one or two of the healthiest, strongest new shoots or suckers that grow at the base of the plant in late winter or early spring. 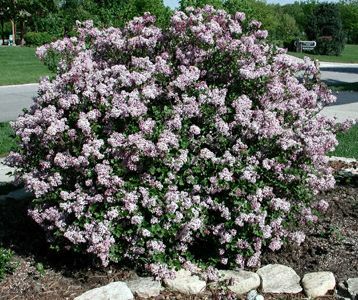 Spacing dwarf lilac shrubs well at planting allows ample sunlight to reach the entire plant, minimizing scraggly growth and the need for pruning. Whenever possible, avoid pruning the lilac in summer, fall or winter, because the lilac blooms on growth produced during the previous growing season. Delaying pruning for more than a few weeks following bloom can greatly impact flowering the next spring. Oh my, I have to look into where to find a dwarf lilac. It is my most loved flower, I have a sweet bush that is just growing so nicely, I even cut a few blooms this spring. I take such good care of him. Thank you for sharing. I think I will look for a dwarf lilac, that would be a fabulous addition to our garden.